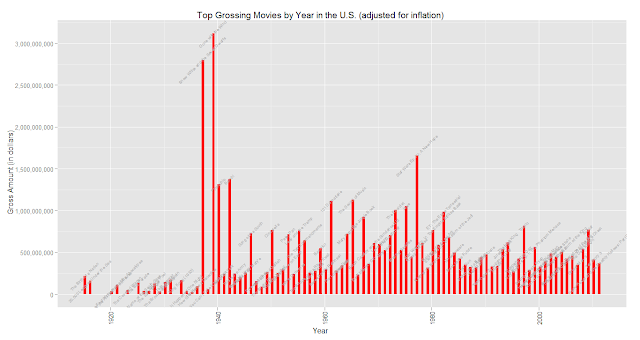 Top grossing movie year by year, adjusted for inflation. This is a bit of an odd chart. It only shows the total gross of the highest grossing movie for each year. When adjusted for inflation, 'Gone with the Wind' is still the #1 money making movie of all time. Curiously, it seems like every other year or so is when the really 'good' movies come out. Before the late 1930s, movies did not pull in much money - why? Why is there such a drastic up/down trend in the movie industry? Since more movies are being made, is that why any one in particular doesn't really stand out anymore? Patrick, below is an *excerpt from the Intro. to "The Economic History of the International Film Industry," authored by Gerven Bakker (posted on EH.net Encyclopedia, Feb. 5, 2010). It's a lengthy read with graphs as well that may be relevant to questions you raised re: your "Top Grossing Movies." *"This article will limit itself exclusively to the economic development of the industry. It will discuss just a few countries, mainly the U.S., Britain and France, and then exclusively to investigate the economic issues it addresses, not to give complete histories of the industries in those countries. This entry cannot do justice to developments in each and every country, given the nature of an encyclopedia article. This entry also limits itself to the evolution of the Western film industry, because it has been and still is the largest film industry in the world, in revenue terms, although this may well change in the future."